Born at Tjiturrunya west of Kintore Ranges in Western Australia, Ronnie was initiated into manhood in Winparku, near Lake Mackay in the Northern Territory. After prolonged droughts in the 1950s, he and his family moved, first to Haasts Bluff, then to Papunya. 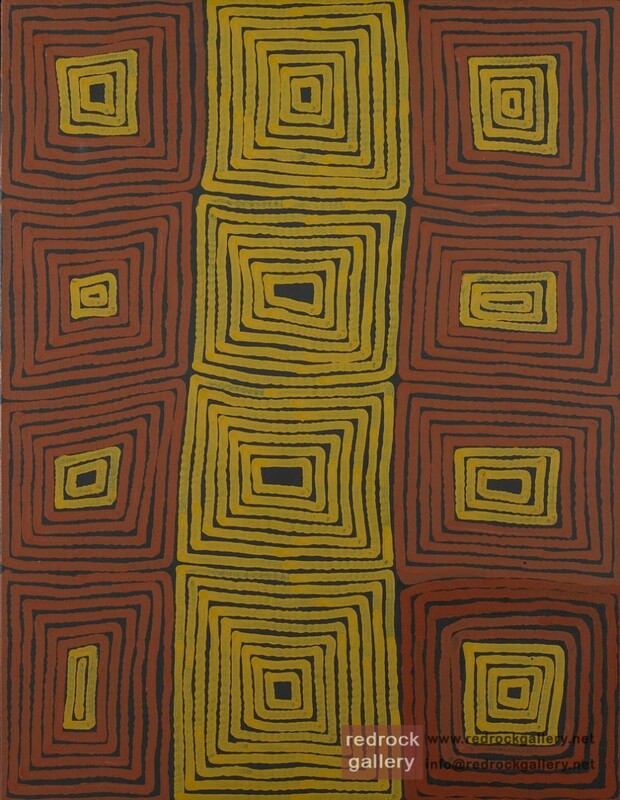 Ronnie Tjampitjinpa’s art is a good representation of the characteristic Pintupi style: repetition of forms, which are geometric, simple and bold, and pigments which are often restricted to four basic colours of black, red, yellow and white. But Ronnie experiments with other colours as well. 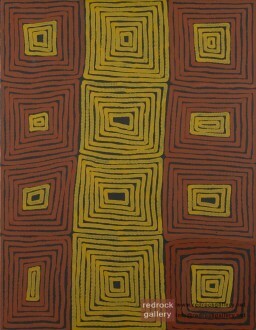 The group of ancestral spirit beings known as the Tingari brought law and culture to the people of the Western Desert. Their journeys, important sites and activities cover a huge area stretching from Pintupi country around the Papunya region 250 kilometres west of Alice Springs southwest to the Great Sandy and Tanami deserts around Balgo Hills, and their depictions are numerous in Western Desert art.